Dom Pérignon is delighted to return for a third year as the Official Champagne of the Santa Barbara International Film Festival; a partnership that celebrates exceptional talent, innovation, freedom of expression and the power of creation in the world of film. Dom Pérignon will be celebrating the honorees in the luxurious, custom designed Dom Pérignon Lounge at The Arlington Theater. Each evening of the festival, inside the exclusive backstage Dom Pérignon Lounge, the honorees are presented with a personalized bottle of Dom Pérignon P2 Vintage 1998 to toast their outstanding performances and respective tribute awards. Honorees including Denzel Washington, Ryan Gosling, Emma Stone, Casey Affleck, Michelle Williams, Isabelle Huppert, Jeff Bridges, Aaron Taylor Johnson, Dev Patel, Janelle Monáe, Mahershala Ali, Naomie Harris, Ruth Negga, Simon Helberg, and Stephen McKinley Henderson will be among the star-studded crowd celebrated by Dom Pérignon during the festival. The Santa Barbara International Film Festival (SBIFF) is a cinephile’s paradise – a celebration of cinema at several historical theaters on the American Riviera in beautiful downtown Santa Barbara. Just a few days after Sundance and well-timed a few weeks before the Academy Awards, SBIFF is a must-stop for front runners on the awards season fast-track. Along with cutting-edge panels for some of the world’s most recognized directors, producers and screenwriters, the festival has honored the artistic achievements of Robert Redford, Cate Blanchett, Oprah Winfrey, Jared Leto, Martin Scorsese, Leonardo DiCaprio, Bruce Dern, David O. Russell, Ben Affleck, Daniel Day-Lewis, Amy Adams, Quentin Tarantino, Jennifer Lawrence, Brie Larson, Johnny Depp, Christopher Plummer, Viola Davis, Helen Mirren and many more. Dom Pierre Pérignon was the procurator of the Abbey of Hautvillers in Champagne from 1668 to 1715. His life’s work was guided by the single aim to create what he named: the “best wine in the world”. Today, each new vintage of Dom Pérignon is inspired by the same quest. For every vintage is a new beginning, a reinvention. Always a vintage wine, the Dom Pérignon commitment to vintages is absolute: Dom Pérignon is made from only the best grapes and is declared only in the most exceptional years, from a single year’s harvest only. Each Vintage has three Plénitudes, and is a true act of creation that is constantly renewed by Chef de Cave Richard Geoffroy. The Santa Barbara International Film Festival (SBIFF) is a 501(c)(3) non-profit arts and educational organization dedicated to discovering and showcasing the best in independent and international cinema. SBIFF offers 11 days of 200+ films, tributes and symposiums that transforms beautiful downtown Santa Barbara, CA into a rich destination for film lovers which attracts more than 90,000 attendees. SBIFF continues its commitment to education and the community through free programs like its 10-10-10 Student Filmmaking and Screenwriting Competitions, Mike’s Field Trip to the Movies, National Film Studies Program, AppleBox Family Films, 3rd Weekend and educational seminars. 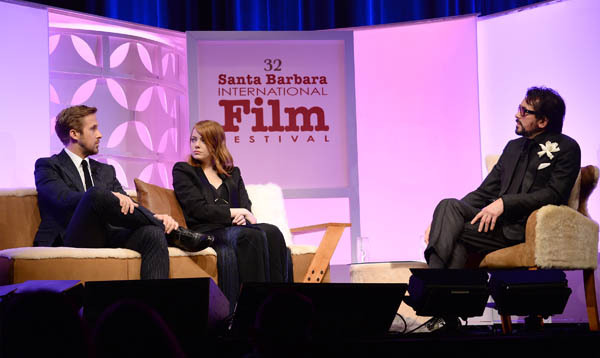 In recent years SBIFF has expanded its year round presence with regular screenings and Q&As with programs like Cinema Society, The Showcase and its Wave Film Festivals.